Surveys, Schedules of Conditions and Dilapidations reports that we carry out on warehouses again and again show the importance of having the roof surveyed. We thought it would be interesting if we shared some of the experiences we have had with roof problems on industrial buildings and warehouses that look in good order from ground level. We once were told by a Chartered Surveyor that the term fiddler on the roof is particularly true in relation to the building industry particularly with a warehouse where there is so much roof that is very hard to see unless you have specialist access equipment. 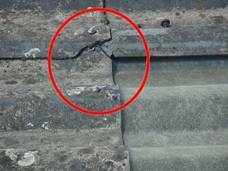 Many buildings which look in good condition from ground level have surprising defects at roof level. We always like to inspect roofs using a good sized cherry picker that is able to reach to every corner of the roof as this gives us a bird's eye view of the roof and also with a skilled cherry picker driver gives us very good close ups. If they are not that skilled we use the x16 optical zoom cameras that we have to focus in on the detail of the roof and any identify any roof problems. 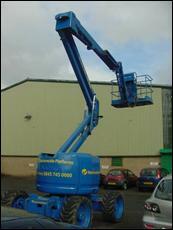 Over the years we have tried all sorts of other things such as long ladders, tower scaffolding, scissor lift, we have even had quad copters which are basically helicopters with photographic equipment and also cameras on telescopic poles but we keep coming back to cherry pickers as being the best for a chartered surveyor to view a roof. Many of the older style warehouses, if not most, were built with a structural frame such as a portal frame and clad with asbestos which at the time was considered almost as a wonder material and a great solution to many problems we had for economic cladding of buildings. Indeed it was used in many ways how wood was once used plus it also had the benefit of insulating and being watertight and also fire resistant so you can see why it was so popular. This was long before the health issues of asbestosis was raised and became common knowledge. We had heard at various training events what a deadly affect asbestos could have but equally we have heard of it being used quite irresponsibly by builders and it not having any affect. It wasn't until we actually encountered it ourselves when a very good builder that we worked with on old and listed properties and indeed worked with asbestos for many years unfortunately passed away from asbestosis that we really appreciated the affect that it could have. Asbestos hasn't been used for many years and indeed has been banned in the UK; although it is said it doesn't ban imports from containing it, we don't know the accurate figures in relation to this. 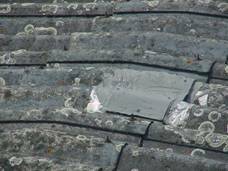 We do know that the asbestos that was used in the post war era are on almost every industrial development that took place is now usually in need of replacing or maintenance or has been replaced. The landlord is of course keen to let any building that is empty as it is no longer making an income from them and what is worse could be costing them money from maintenance and rates. The commercial letting agent employed by the landlord is paid when the property is let so their focus is on the plus side of any property. This could be anything from location to the meter squared or foot squared but also the initial impression that people have of the building often helps decide whether the property will be sold or let. 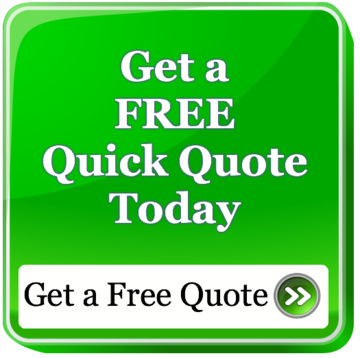 We have heard that most people look for their properties initially on the internet. It is very much that first visual impact that a building has that draws your attention to it. The internet, depending upon the quality of the website, can then give all sorts of information in relation to the building from a location map to the size of the warehouse divided between warehouse space and office space. Often we make decisions much quicker due to time pressures that are on us. It is so important with a building to ensure that you are buying the right building. Did you take three seconds to assess the suitability of the warehouse? It is not strictly fair to say that it takes most people three seconds to assess the condition of a building as time and thought have usually gone into the location and the size of the building required, however the three seconds is generally said to be the time that we make our initial decision when approaching a building and a further three to six seconds as we go inside and have a look around. We are not aware of any definitive research on this but it is a factor that letting agents and estate agents are well aware of, which is the outside kerb appeal of a building and the inside interior appeal. This is just the same with industrial buildings and warehouses. If the exterior looks good then customers tend to look inside. If the interior looks good then customers have the property on their wish list which is after all what the commercial estate agent or commercial letting agent has to do. This can lead, when a building is in poor condition, to the external part of the building being clad but to save money, just the part that everyone can see and equally internal refurbishments where just the parts everyone can see are refurbished. 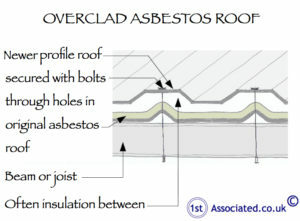 The area where we find the most asbestos is the roof. This, we believe, is because it is hidden from everyone's view so it doesn't count in the three seconds that you look at the external of the property for kerbside appeal and it doesn't count in the six or so seconds you look at the interior. 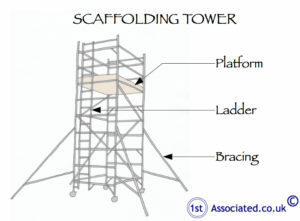 What it does mean if you take on a building such as this is that you have a liability for it at the end of the lease or if you are purchasing the warehouse you will ultimately have the bill to re-roof which when you consider the scaffolding costs alone to gain access and to enclose the asbestos can be considerable. 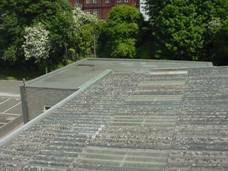 We have dealt with several cases where hidden asbestos roofs have ultimately been the reason a client doesn't buy a property. We were working for a client who thought they had found a bargain in a large commercial property (not a warehouse or industrial building in this case) and when we came back with the survey saying that it had asbestos in it, they were very surprised and initially completely put off buying the building. Even when it was discounted and they had carried out their research it was no longer worth their while and even when it was considerably discounted it was still no longer worth their while and they walked away from the property. This is when the walls are reclad on an existing warehouse when it looks old over the top of any asbestos cladding as it is the most economical way as to remove asbestos can be very complicated and expensive due to the handling regulations and the sealing that is required of the warehouse. 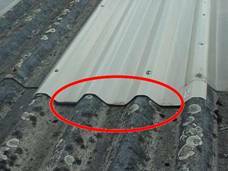 Asbestos is now deteriorating and getting damaged – what do you do? The difficult situation is where the asbestos on the building is starting to deteriorate. 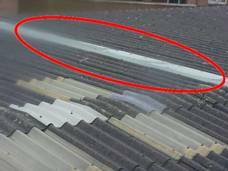 Firstly, if it is on the roof you perhaps don't notice unless the roof leaks and secondly, can you just replace one panel of asbestos? 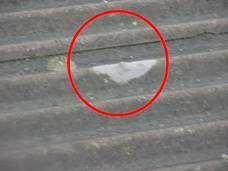 The answer in most cases is no, as the asbestos is of a certain shape ,which is no longer readily available so you may end up replacing large sections of the roof or alternatively carrying out a repair of the asbestos which is never ideal as you are obviously handling dangerous material. We dealt with a warehouse which had been leased subject to suitable repairs being carried out to the roof by the landlord. 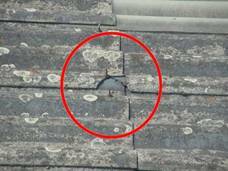 What the landlord didn't appreciate was the extent of the repairs to be carried out and also he didn't realise that the tenants letting out the property would ask us to inspect the roof before and after the repair work. The landlord had carried out a liquid bitumen type repair in some areas and also a fibreglass repair in other areas. The problem with this when looked at when you are having a five or ten year lease or longer is that the asbestos moves a fraction in different climates and as such a hard fibreglass repair doesn't work in the long term and the bond is lost and the liquid repair doesn't work because it cracks and opens up. We negotiated long and hard for our client and ultimately they had to accept it because the landlord said so; if only we had been brought in on day one before they took on the lease. The anchor bolts / fixing bolts hold the asbestos panels on. 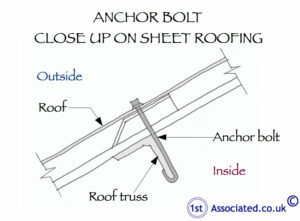 We come across problems where the anchor bolts rust or the end caps over the anchor bolts are missing and are susceptible to rusting. In addition we have seen where the holes have got bigger when the wind moves them.